Who says breakfast can’t be can’t be luxurious? When it comes to breakfast, especially a lazy weekend type of breakfast, we often turn to Vietnamese soups such as pho or bun bo hue or stews such as bo kho. Occasionally we’ll have eggs, but typically hot ga op la style (take from the French for fried egg oeuf au plat), a sunny side up with a dash of Maggi seasoning served right in the pan with a small loaf of toasted baguette. Over the weekend, however, we decided to make breakfast extra special for no particular reason other then we had some time and we really wanted to make a dish featuring some new nonstick pans we were testing out. But instead of hot ga op la, we decided to fancy it up with sea urchin roe, or as the Japanese call it uni, a favorite delicacy of ours when dining out. 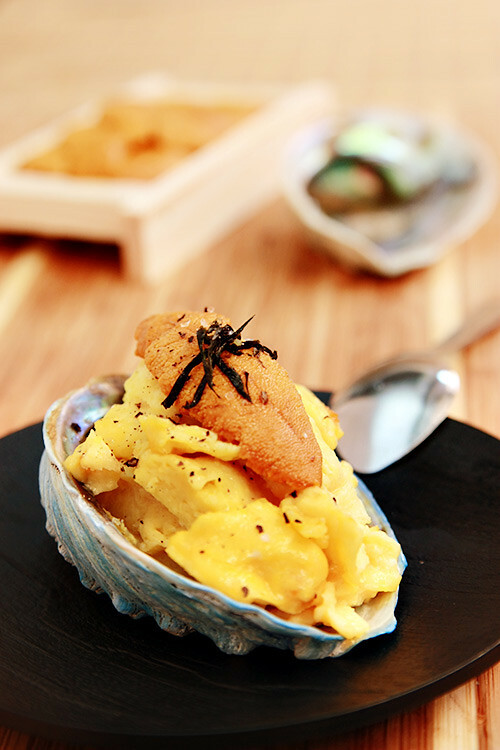 Uni has a light, sweet, and briny flavor and creamy consistency that we thought would be wonderful with scrambled eggs. We adapted the idea from a great blog called Marx Foods, which also happens to purveyors of some great delicacies. 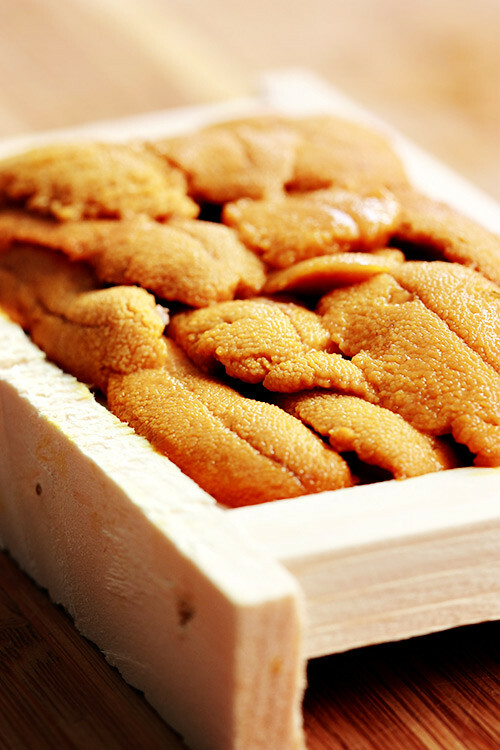 You can typically find trays of uni like this in your local Japanese and Korean markets. 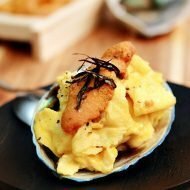 Although scrambling eggs seemingly is a simple task, if you ask 10 chefs, you might get 10 different answers on the best recipe and technque for perfect scrambled eggs. There’s the Martha Stewert method, the Gordon Ramsey method and countless others. Feel free to use your favorite method to scramble eggs, whether it’s the Gordan Ramsey method, Martha Stewart method, or your own. Some consider uni an aphrodisiac, so with Valentines day around the corner, prepare this unique and luxurious breakfast for your loved one and they’ll love you forever.. In a miniprep or food processor, puree the 3 sea urchin roe with the 3 ts of milk. Crack three eggs into mixing bowl and add the puree. Whisk well, for about 1-2 minutes. In a medium heated nonstick pan add butter and when it liquefies, add the egg mixture. When the mixture is just about to set, we use the Martha Stewart method of using a spatula to push the eggs to the center and tilt the pan to distribute the runny parts. Continue and break apart any large pieces. 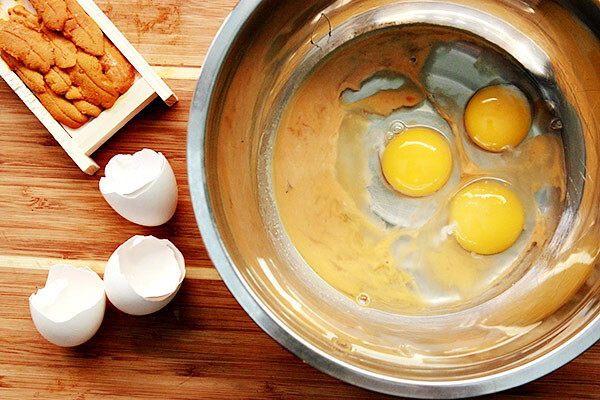 When there are no longer any runny parts, flip the eggs over and cook for another 10-15 seconds and remove from heat. Add salt and pepper to taste. Transfer to serving plate, top with additional sea urchin roe and nori strips and serve immediately. Cooks note: This recipe is easily adjustable, adding 1 sea urchin roe and 1 ts of milk to the puree for each additional egg. We’ll be remissed if we didn’t point out that Tet, the Vietnamese celebration of the lunar new year is February 3rd. For Vietnamese, it is the year of the Cat, the only animal that is different from the Chinese zodiac. For the Chinese, it’s the year of the Rabbit. Last year we had a series of posts on traditional Vietnamese foods but this year, we have a different plan. 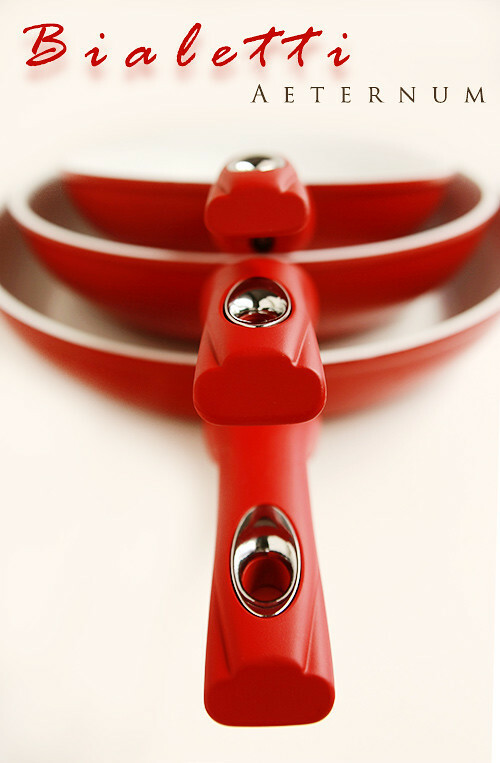 If you haven’t noticed, we cooked these eggs in a beautiful red ceramic coated Aeternum pans from Bialetti. Red being the color of weatlh, prosperity, and good fortune during Tet, we thought it would a perfect time to do a giveaway of a a set of Aeternum pans courtesy of Bialetti. As you can see, these pans are visually stunning. It was pleasure to cook with them as well as to photograph them, not to mention they look great on the stove. But looks aside, how does this pan perform? 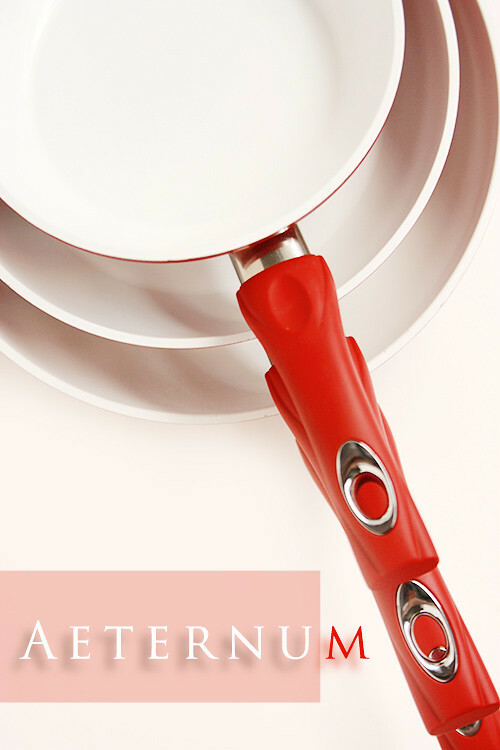 We’ve made quick stir fries, dumplings, eggs, and more with these pans and it did a great job. 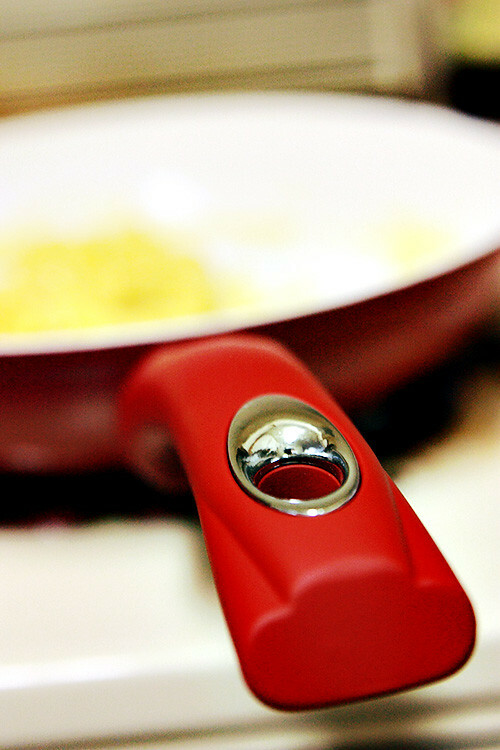 The nonstick surface is made of white nanoceramic coating which is free of PFOA, PTFE, and free of Cadmium. The heat seemed well distributed and weight of the pan felt sturdy. Our only concern was that the beautiful white surface might stain especially with colorful foods such as curries and that the coating might chip. So far, with routine use neither has been a problem. As with any good nonstick pan, the amount of oil we used was reduced without much noticeble difference in flavor of foods. Browning of foods such as dumplings also was suprisingly good. 1. Subscribe to our blog via RSS or email for one entry and leave a comment stating what you wish for your loved ones in the New Year. If you already subscribe, no need to unsubscribe and re-subscribe, just state what you wish for your loved ones in the New Year. Unlike western New Years tradition of making personal resolutions, the Vietnamese tradition is wishing well upon others in order to receive good luck and “li xi” lucky money! 2. Like the Ravenous Couple Facebook page and leave a separate comment on this post stating such. 3. Like Bialetti’s Facebook page and leave a separate comment on this post stating such. 4. Follow us on Twitter and tweet this statement exactly ” Vietnamese New Year #Tet #giveaway: win a set of Bialetti Aeternum pans from the @ravenouscouple http://j.mp/hyjRxw Pls RT ” without the quotes and leave a separate comment on this post saying you tweeted. The contest ends in one week 2/9/11 12 am pacific time and we’ll notify the winner by email. Using Random.org, congratulations to Kim who left the comment: My mamma, who gave up her career as a teacher in VN and traveled over by boat to the USA to give me a better life… and who has worked in “manufacturing” ever since (not the same as teaching), is now, in these economic times, looking for a job. So this year, I wish her (and the rest of my family) a little more prosperity. We’ll contact you! If you do not have a blog, please leave an email adress so we can contact you. Again we apologize to our international and Canadian readers. Good luck and Chuc Mung Nam Moi! Chuc Mung Nam Moi! This year I'm wishing my family and friends good health! 2010 was a rough year and we're all waiting anxiously for the Year of the Cat so we can start with a blank slate! ahhh what a coincidence! I made fried eggs with Maggi sauce this morning, and my non stick pan is no longer non stick. I made a mental note to look for a really nice one this time too! I did all 4 things, and I hope to be able to get this set! The Italian Bialetti products are amazing [i had 2 italian roomies with bialetti coffee makers in college]. 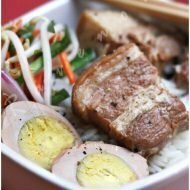 my fiance who is french, has been trying really hard to learn to make viet food, and i wish for her to be able to use this wonderful site to expand her love of cooking and making viet food. It'd be cooler if she had the new Aeternum pans from Bialetti 😉 Chuc Mung Nam Moi you brilliant cooking people you! Chuc Mung Nam Moi! Now that's a luxurious breakfast indeed. And those pans look so handsome!! Looks like a beautiful recipe! I can't wait to try it out – hopefully, by using that beautiful Bialetti pot and pan set! I wish my loved ones good health and much happiness all year long. And good cookware. I subscribe via RSS (Google Reader) and even though I'm in Canada, if I won this wonderful cookware, I would have it delivered to my son in Kentucky. He needs good SAFE cookware. Happy new years! I love your blog and have used many of your recipes and they've all turned out great I just recently started following you two on FB. That looks decadently delicious. My husband loves loves loves uni — he's been desperately trying to get me to try Sushi Puzzle here in San Francisco where he claims you can order it by the trayful (like your pictured); I've been trying to get him to Sebo, where they import their fish all the way from Japan. Happy New Year! Hope it is a prosperous one! Woo! Year of the CAT. My mamma, who gave up her career as a teacher in VN and traveled over by boat to the USA to give me a better life… and who has worked in "manufacturing" ever since (not the same as teaching), is now, in these economic times, looking for a job. So this year, I wish her (and the rest of my family) a little more prosperity. Ooh, I forgot to mention, you're in my RSS reader, AND I've hit the "like" button on FB. Also added to my page's favorites. I am subscribed to your RSS feed. I wish health and happiness to my loved ones. I wish my sister good luck in trying to conceive and my whole family good health! I liked Bialetti's FB page. I did all 3 things for facebook and commented. My sister would love this set…to cook for me! She's been looking for it for this brand awhile now, and she'd be really happy to get it. I definitely follow you guys on twitter =) and have retweeted the giveaway! Woothoo! We love Ravenous Couple on Facebook! I tweeted, thanks for the great blog. Happy New Year!!! Keep the wonderful recipes rolling! Wishing you two all the best for the new year! Happy New Year! My one wish for my family and friends is good health and happiness! Happy New Year! My one wish for my family is good health and happiness! Chuc mung name moi! For the Year of the Cat, my biggest wish is for my son as he graduates high school and moves on to college and real life. BTW, I've used several of your recipes lately and am in love with your blog. ooh i've been wanting one of these pans! i am subscribed via rss (google reader). i wish happiness & good health for my loved ones this year. very simple, but those are the good things in life. This year I wish for my family to become financially stable so we can enjoy a happy fruitful year together. Wow! and here I thought truffle scrambled eggs were lush! Chuc Mung Nam Moi – I tweeted! 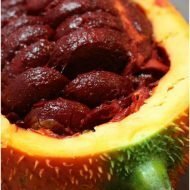 Love the recipes on your blog! I'm following on twitter (@thinktran) and retweeted about the giveaway! Happy New Year! My family has trips planned this year, so I'm wishing them safe travel. I wish all my family a prosperous year, but especially my brother and his family. I subscribe to to the rss feed already. I "like" Ravenous Couple on FB! I "like" Bialetti on FB! For the New Year, I wish for my loved ones good health and happiness! For the new year, I am wishing health and new adventures to all my friends and family! I "like" Bialetti on facebook! I like Ravenous Couple on Facebook. I like Bialetti on Facebook. For the new year, I wish all my family and loved ones strong health, endless happiness, lots of fortune, and great Foodventures! I am already a subscriber so I wish for my sisters to find a kind and gentle man to love and cherish them all the days of their lives. I like the Ravenous Couple Facebook page (Cheryl HeartnSoulmom). I like Bialetti's Facebook page (Cheryl HeartnSoulmom). Oh my goodness your uni looks amazing! 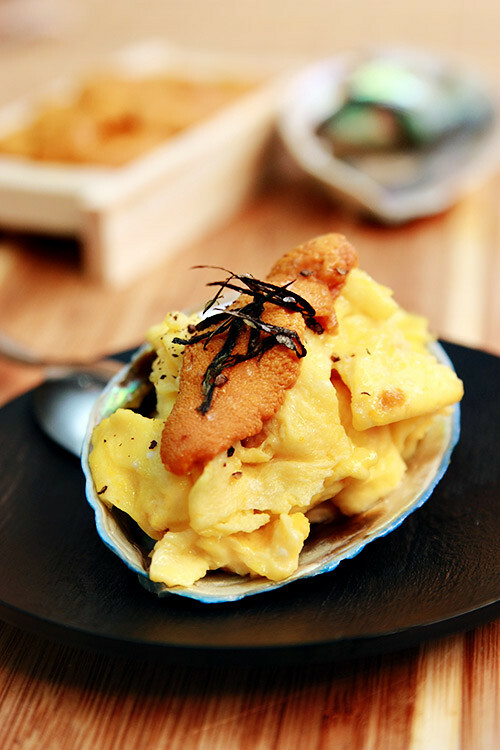 I never would have thought of serving it with scrambled eggs, but I know my husband would devour it! I wish you both, your readers, and my loved ones a wonderful new year full of good food and happy moments. Yes, I already like you on FB! I subscribe to your blog via RSS and I wish happiness for my loved ones in the new year. One of my co-workers gives me lucky money every year! Love your blog and your pics are always beautiful! I wish that my family stays healthy this year, and together…we seems to be growing apart as we get older :/ everyone is so busy!! I wish for my family & friends continued good health, more laughter & togetherness, and better prosperous outlook. Chuc Mung Nam Moi! as well as Bialetti's fb! I've liked your facebook website. Hopefully we'll be in the running for the Bialetti's set. We like making the braised pork and egg! Chuc Mung Nam Moi I subscribe your blog!! Love Love your blog. Thank you so much for sharing your love of cooking! for my family i wish good health in the new year.i suscribe to your blog via rss feed. I wish for my family good health and happiness in the coming year. Entry #1: I'll go with the traditional wish of health & happiness for my family, friends & loved ones for the new year. Entry #3: I liked Bialetti on FB. About time too, as I use my moka pot every day. Entry #4: I'm following you on twitter. But I was already doing that. I wish my family good health and luck in the new year! I 'liked' the Bialetti FB page! I subscribed to your email! I wish for good health for my family! 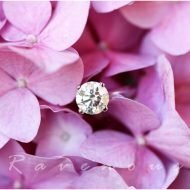 I like the Ravenous Couple FB page! I like Bialetti's FB page! I subscribed to your email and wish everyone a happy and peaceful new year! Wishing my younger brother who has been in a deep depression much happiness in the Year of the Cat which should be a better and calm year. I also hope to have a baby this year and would wish for a safe pregnancy with pans that have nanoceramic coating which is free of PFOA, PTFE, and free of Cadmium. Chuc mung nam moi to my Vietnamese friends and family and Gung Hay Fat Choy to all my Chinese friends! Wishing my loved ones happiness in the new year. Chuc mung nam moi. Here's to healthy and happy year! Chuc Mung Nam Moi!! I wish for love ones to be healthy for a long time, have fun in life, let the money flow in like water, and all that good stuff. And I have done all 4 requirements. I wish happiness and good news to all of our family and friends this new year! I wish my loved ones Great Health, Happiness, wisdom, and prosperity. I liked you on FB! Love your blog! Keep up the good work and Happy Lunar New Year! As for the contest, you've been liked (long time ago) and I've twittered the quote. I'm going to have to try making uni scrambled eggs. It doesn't get easier than this to incorporate uni. These pans are quite nice, but don't enter me into the drawing, we're at max capacity in our apt. Hi – Chuc Mung Nam Moi! Looking forward to an amazing year ahead as we celebrate the year of the Cat. I've liked you on FB, Bialetti on FB, added your blog in my reader. Thanks for the opportunity to win some great looking pans. I liked Bialetti's Facebook page. Hi – added your blog to my reader. this year i'm wishing my family good health! Happy New Year to both of you and your family. "Nam Moi", I wish my grandmother and my mom to stay healthy and enjoy a happy time with us and their grandchildren. I like Ravenous Couple on Facebook page. I like Biattle's on Facebook page. I'm subscribed to you via RSS in Google Reader! I wish that my little sister is successful in getting into a great university, that my mother feels appreciated for all of the work she does, and that my boyfriend finds success in college so that we all may be happy and prosperous. I subscribed! I wish for my family good health. My son has a condition, Hydrocephalus, and it effects him often. So I would love for him to have a netter year. I liked Bialetti's on FB too. I liked Bialetti on facebook too! What a gorgeous looking pans. In case I got picked my aunt lives in NYC =D Happy New Year! RSS subscribed! I'm wishing for good health for both Son's family and mine, since there have been some problems in the recent past. I have never used uni before but these look and sound delicious! I am wishing great health and wealth to all my family this year! I wish for my family to be safe and happy this year! I like Bialetti on fb! I also like the Ravenous Couple on fb! This year, I wish for my family and friends to have a happy, stress-free year full of great memories and delicious food…preferably food I've gotten to cook with and for them! Following! I wish them some genuine happiness and feeling of connectedness in the new year. I just want good health and joy for my me and family in this new year! I subscribe via Google Reader and I just subscribed via email. I already like RC on fb. Chuc Mung Nam Moi! I love your blog — you guys have become my go-to spot for Vietnamese recipes. Wishing you both a prosperous and happy year ahead. I Facebook liked you guys! This sounds fantastic…wishing lots of great culinary adventures in the New Year! I subscribe on google reader. I wish for my love ones to have happiness and peace this new year. using random.org, the winner is reader Kim who wrote " My mamma, who gave up her career as a teacher in VN and traveled over by boat to the USA to give me a better life… and who has worked in "manufacturing" ever since (not the same as teaching), is now, in these economic times, looking for a job. So this year, I wish her (and the rest of my family) a little more prosperity." Thank you everyone for entering and chuc mung nam moi! Vietnamese food is very tasty and will try this soon! thanks chef!